Get an exclusive sneak peek at the prog metal axeman's new album. 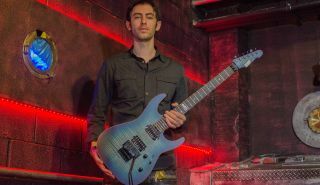 Classically trained progressive metal guitarist Steve Dadaian is no stranger to GuitarWorld.com, having served up a couple monstrous "Betcha Can't Play This" videos a couple years back. Today, we've teamed up with the New Jersey-based axeman to premiere the music video for "Follow the Light," the title track from his new album. You can check it out below. "The title track, 'Follow the Light,' has special meaning to me as it was the first song I wrote for this album, and ultimately inspired the other eight songs on the album," Dadaian told Guitar World. "The concept behind the video was to showcase the performance in a setting that had imagery consistent with the album artwork. The themes are haunting and while writing, I strove to find a balance between technical and melodic components for the listener to enjoy." Follow the Light is set for a February 1 release. A nine-track concept album, it revolves around the discovery of an abandoned citadel deep in a forest, and the events that follow. "Follow the Light," Dadaian told Guitar World, "Represents the ancient structure on the album cover and the beginning of the events that unfold thereafter." Follow the Light features Ryan Bertone on drums, plus a vocal feature from Soilwork's Björn “Speed” Strid on the song "Soul Connection." It can be preordered right here. For more on Steve Dadaian, be sure to follow along on Facebook.